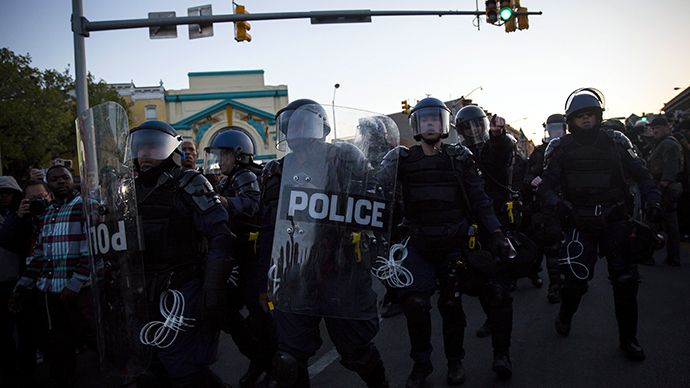 Tensions are high in the North West of Baltimore following a gun shot. Eyewitnesses say police fired at a man. Officers claim it was the man's gun that fired when he dropped it. Reports surfaced at around 2:45 ET that a man was shot close to the intersection of Pennsylvania and North avenues near the epicenter of where protests have erupted in the days since the arrest and death last month of Freddie Gray, a young black man. A commander with the Baltimore Police Department at the scene told a journalist with the Baltimore Sun that authorities were trying to arrest an armed man when that person’s gun fell and went off. “No one was injured,” a Baltimore Police Dept. officer told CNN later. The BPD’s claims run contrary to those of eyewitnesses, including a producer for Fox News who said live on the air that a young black man who had been shot once and “didn’t appear to be in good shape.” The producer, Mike Tobin, added that a gun was on the scene after the victim was taken away “and it didn’t look to be the officer’s weapon.” Fox has since retracted its claims of an officer-involved shooting. RT’s Manual Rapalo reported from the scene that authorities were quick to clear the scene by discharging pepper-spray as a crowd gathered. Fox captured paramedics rushing the man away and onto an ambulance, and photographers and onlookers were captured live on camera suffering from blasts of mace to the face.